Lingle (1902-1962) was an unusual major foundation ragtime pianist: he was recorded. In 1950 Rudi Blesh reported several major players still working (notoriously, Glover Compton) who apparently never were. Like Scott Joplin's friends Brun Campbell and the Irish-American Joseph Lamb, a major rag composer Moses Asch recorded, Lingle was white and an original. 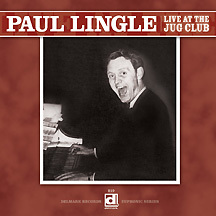 An accomplished, bread-earning, schooled pianist in numerous contexts from 1914, Lingle gets confused with such younger 1940s associates as Bob Helm (1914-2002; clarinetist, author of this set's biographical note) who worked to revive 1920s jazz. Lingle had been precocious, a pro active from 1914, and he remained an artist dedicated to musical values which are worth asking about. Fashion dictated only what he could get paid for playing. After 1920, that was hardly ever ragtime. In 1951 Charles Campbell taped Lingle in a repertoire unusually elevated for his nightly gig in an establishment apparently well named. Offered those tapes, Lester Koenig made Lingle's one studio recording (1953, on the Good Time Jazz label). There's no more. Campbell's Lingle tapes were eventually sampled on Paul Affeldt's piano specialist Euphonic label (1960s), whose holdings Delmark acquired and has been issuing on CD. Scott Joplin conceived Ragtime as a follow-the-printed-page music. Every major rag pianist, Brun Campbell reports, found that way dull and took his own individual line within an overall stylistic definition. It's worth asking about the differences between Lingle's playing and that of contemporaries, the ways in which he's not like them. His brief "September in the Rain" is beautifully lyrical. "Strut Miss Lizzie" opens quite modern before echoing Fats Waller in the right hand; but not the left and not the rhythm. On Waller's "Squeeze Me" Lingle's even farther from Harlem than is his California home. In two minutes "Miss Lizzie" becomes very unladylike, with stamping left hand. Good at barrelhouse directness, in "Sister Kate" Lingle's variation in tone palette defies the piano. He has an amazing filigree lightness of touch and also a capacity to stamp a left hand beat. The sensibility is unusual and ragtime seems to involve a discipline of clear rhythmic articulation, to a degree which nothing is allowed to blur. Jelly Roll Morton's "Mamie's Blues" retains its moving simplicity because of Lingle's seamless idiomatic incorporation of musical refinements. He sometimes recalls Morton, whom he might as a lad have heard in California. He can also recall the very different Eubie Blake, which already speaks volumes. Lingle has range. There's light and springy, there are slams, growls, rolled counter-melodies, cross-rhythms, unusual harmonies, fast light filigree and also biting fancy-work. The repertoire is mostly c.1920, with two rags by Lingle himself. He was a specialist, a national treasure of a lost range within ragtime-playing, which nobody paid for between roughly 1920 and 1940. © 2005 RootsWorld. No reproduction of any part of this page or its associated files is permitted without express written permission.